When it comes to high-quality roofing and remodeling services here in the Huntington Station area, savvy homeowners know that the only name in reliable service you need to know is Magnum Contracting Group. At Magnum Contracting Group, we are the premier roofing company the Huntington Station has to offer, and our team of skilled professionals would be happy to provide you with the comprehensive roofing and remodeling services you need to enhance the beauty, security, and overall function of your home. Are you looking for a professional Huntington Station roofing contractor you can trust to provide you with the quality services you need to keep your home looking and performing its best? If so, give our team of skilled professionals a call today and let us show you the level of quality service that's helped make us one of the most trusted names in roofing and remodeling services the local area has to offer. Here at Magnum Contracting Group, each and every one of our professional Huntington Station roofing and remodeling contractors are fully licensed, trained, and insured, letting you have peace of mind in the knowledge that your project is in the hands of a team of skilled professionals who will be able to deliver the level of quality you need in your finished results. Whether you're looking for roofing repairs, replacement, or routine maintenance, or you're looking to make some general improvements around your home with a comprehensive bathroom or kitchen remodeling project, our team of skilled professionals can help you make it happen. If you have any questions about our full line of high-quality roofing or home remodeling services, or if you would like to schedule an appointment for consultation to go over your prospective project, give us a call today. Our team of experts are always standing by and would be happy to assist you in any way we can. If you own your home for any length of time, you're likely going to be faced with the prospect of having to replace an aging roof at some point, and when that time comes, you want to be sure you have the name of a professional roofing contractor you can trust that can help guide you through this overwhelming process. Whether your roof suffers serious damage in a storm of just starts to wear out due to old age, there's going to come a time when repairs are no longer a cost-effective option. Having a knowledgeable roofing contractor you can trust to help you with your roof replacement process is important as there are any number of things that can go wrong, leaving issues for you and your family to deal with that could have been easily avoided if the job were done right. 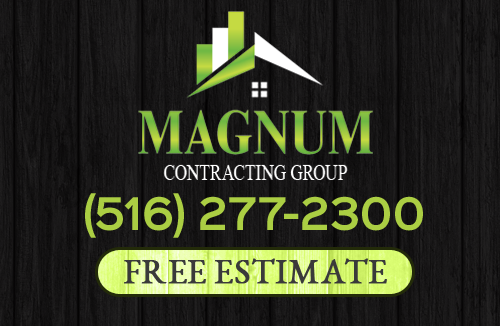 Here at Magnum Contracting Group, our team of professional roofing contractors have plenty of experience in the roof replacement process and can provide you with the kind of quality results that you and your family will be able to rely on for many years to come. If you are looking for a professional Huntington Station roofing contractor or remodeling company, give Magnum Contracting Group a call today at 516-277-2300 or complete our online request form.